All of the doctors at Southern Idaho Ophthalmology have extensive experience in diagnosing and treating macular degeneration. We have state-of-the-art equipment to help provide earlier diagnosis and more effective treatment. You can receive your treatments here in the Magic Valley without having to travel far from home. Macular degeneration is a deterioration or breakdown of the macula. The macula is a small area in the retina at the back of the eye that allows you to see fine details clearly and perform activities such as reading and driving. 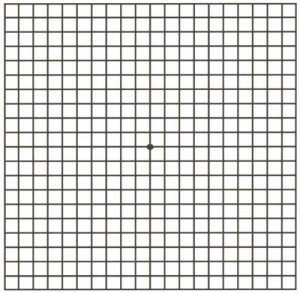 When the macula does not function correctly, your central vision can be affected by blurriness, dark areas, or distortion. Macular degeneration affects your ability to see near and far and can make some activities—like threading a needle or reading—difficult or impossible. Macular degeneration alone does not result in total blindness. Even in more advanced cases, people continue to have some useful vision and often are able to take care of themselves. In many cases, macular degeneration’s impact on your vision can be minimal. Many older people develop macular degeneration as part of the body’s natural aging process. There are different kinds of macular problems, but the most common is age-related macular degeneration (ARMD). Macular degeneration is the leading cause of severe vision loss in Caucasians over 65. Most people have the “dry” form of ARMD. 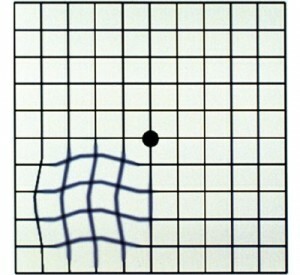 Vision loss is usually gradual. It is caused by aging and thinning of the tissues of the macula. The macula is unable to dispose of all waste products, and these build up under the retina. These deposits under the retina are called drusen. Drusen alone usually do not cause severe vision loss, but when they increase in size or number, this generally indicates an increased risk of developing advanced ARMD. The “wet” form of macular degeneration accounts for about 10 percent of all ARMD cases. It results when abnormal blood vessels form underneath the retina at the back of the eye. 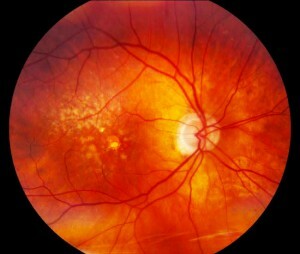 These new blood vessels leak fluid or blood and blur central vision. Vision loss may be rapid and severe. 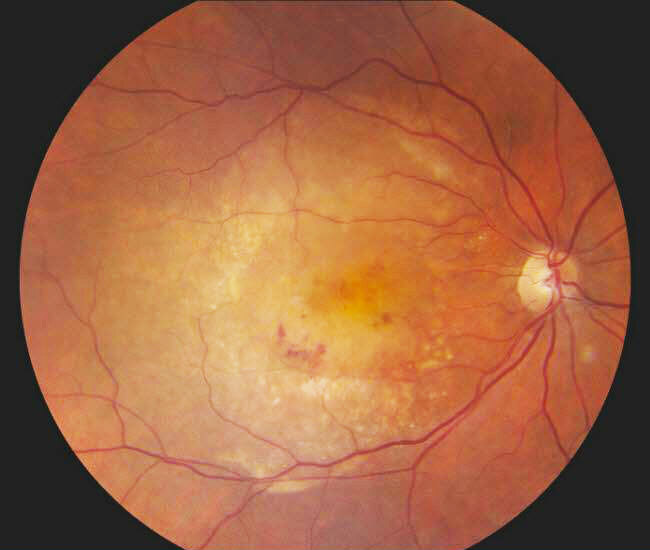 People at risk for developing advanced ARMD have significant drusen, prominent dry ARMD, or abnormal blood vessels under the macula in one eye (“wet” form). Although the exact causes of macular degeneration are not fully understood, it is believed that inflammation plays a key role. Antioxidant vitamins and zinc help reduce inflammation and may reduce the impact of ARMD in some people. A large scientific study found that people at risk for developing advanced stages of ARMD lowered their risk by about 25 percent when treated with a high-dose combination of vitamin C, vitamin E, vitamin A (beta carotene), and zinc. Among those who have either no ARMD or very early ARMD, the supplements did not appear to provide a benefit. It is very important to remember that vitamin supplements are not a cure for ARMD, nor will they restore vision that you may have already lost from the disease. However, specific amounts of these supplements do play a key role in helping some people at high risk for advanced ARMD to maintain their vision. We can help you determine if you are at risk for developing advanced ARMD and to learn if supplements are recommended for you. Certain types of “wet” macular degeneration can be treated with an intraocular injection of a medication that blocks the signal for abnormal blood vessel growth under the retina. That chemical signal is called vascular endothelial growth factor (VEGF). Anti-VEGF drugs block the trouble-causing VEGF, reducing the growth of abnormal blood vessels and slowing their leakage. This treatment generally results in stabilization of vision. If the vision change is treated promptly, the medication may even be able to restore vision. However, because the body breaks down the medication, most patients require repeated injections over time. To help you adapt to lower vision levels, we can prescribe optical devices or refer you to a low-vision specialist or center. A wide range of support services and rehabilitation programs are available to help people with macular degeneration maintain a satisfying lifestyle. Because side vision is usually not affected, a person’s remaining sight is very useful. Often, people can continue with many of their favorite activities by using low-vision optical devices such as magnifying devices, closed-circuit television, large-print reading materials, and talking or computerized devices. Because early detection and treatment are vital to preserving vision, we recommend self-monitoring. 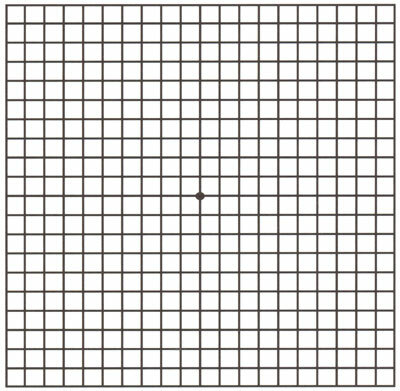 You can check your vision daily by using an Amsler grid like the one pictured here. You may find changes in your vision that you wouldn’t notice otherwise. Putting the grid on the front of your refrigerator is a good way to remember to look at it each day. 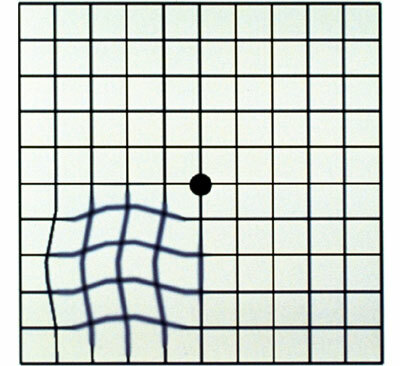 If any area of the grid looks wavy, blurred or dark, call us immediately at (208) 734-8934.